Vietnam engages in the green growth and global goals 2030, joins hand with Government of the P4G countries. 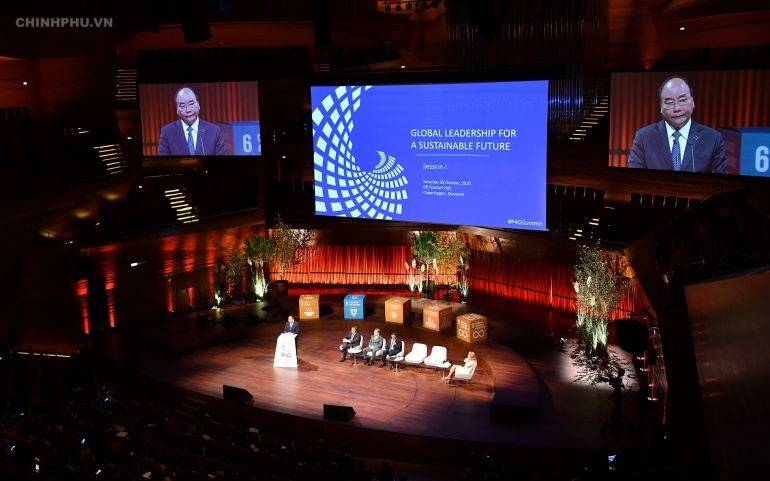 PM Nguyen Xuan Phuc stressed the point at the P4G Copenhagen Summit 2018 in Copenhagen, Denmark on October 20, which also drew the attendance of the Republic of Korea’s President Moon Jae-in, Ethiopian President Mulatu Teshome, Dutch PM Mark Rutte and Denmark’s PM Lars Lokke Rasmussen. The summit is expected to map out vision, major orientations, measures and action plans to accelerate green growth and sustainable development at global scale. Addressing the event, PM Phuc highly spoke of Denmark’s initiative on the establishment of the P4G, which provide a platform for policy-makers and business community to discuss and propose policy recommendations to promote public-private partnership (PPP) in green growth. He expressed his hope that potential PPP projects in this domain will be soon developed and implemented to contribute to achieving the global sustainable goals. As a founding member of the P4G, Viet Nam officially announced the P4G National Forum on July 5, 2018 with the participation of a number of ministries and businesses, including foreign-funded ones, according to PM Phuc. The Vietnamese leader highly appraised the efforts of the P4G, especially the Danish Government in accelerating sustainable development through deployment of its green growth strategy, especially financial support for start-ups in Viet Nam. The nation is willing to speed up the implementation of the forum’s initiatives on promoting PPP for green growth, especially in energy saving and renewable energy, agriculture, water resource, smart urban development among others.